Nearly six months ago I did what many people would consider crazy: quit my cushy job at Google out in sunny, Silicon Valley and moved home to Ann Arbor Michigan, just in time for winter. Determined to live near family and to start a new venture close to my heart, I considered many ideas. The theme that kept arising was connecting people more deeply to their sources of food. I believe that when people know more about where their food comes from, they are lead naturally towards the choices that are healthiest for themselves and the environment. To that end, I’m thrilled that Real Time Farms is live today, just in time for the opening weekend of many farmers markets across the country. It is a live local food guide that not only helps you find farms, markets and stands near you, but also brings you a real time view of what is fresh right now. Here’s how Real Time Farms works: users post photos from farmers markets and farm stands, and those photos get tagged with the farm, market and items in the photo. These posts are grouped together into a live report and indexed to make it easy to find whatever it is you are looking for. The end result is that you can visit the site regularly to browse and search for what is fresh near you. This is also your opportunity to share your enthusiasm for your favorite farms and markets to draw others in. By simply posting a photo you will help others understand why it is worth their while. After all, not all mushrooms are created equal. You can upload photos to the site directly, or email them from your smartphone to share@realtimefarms.com. You can also help by tagging existing photos with the vegetables and other items you identify in them. 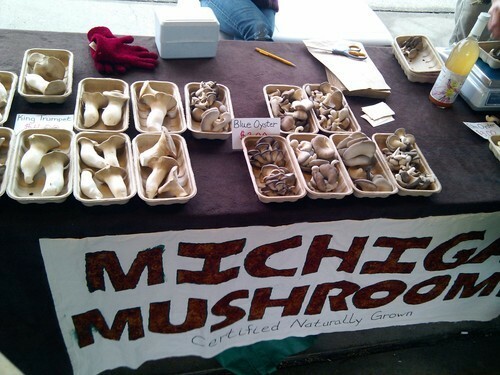 As of today, all of the posts are from markets in the Ann Arbor area. Start by checking out how it works there, and then change the location and begin posting to get it going in your area. This entry was posted in Messages From the Founders and tagged food guide, karl rosaen, local food, local food guide, Real Time Farms. Bookmark the permalink.